Keynote 3: Marlies Meijer (MSc B.Eng), ARN B.V. The workshop language is English. Further details will be announced in the workshop invitation soon. The registration period has expired. Workshop seats are limited to 40. Workshop participation is free of charge. 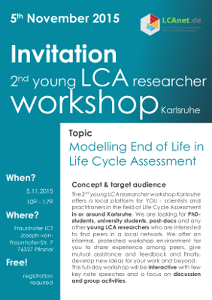 Please register via e-mail to Ute Laubach (ute.laubach@ict.fraunhofer.de ) until October 23rd 2015.